First Line: So if I were going to put a date on when the series of crises at the Institute for Forensic Medicine in Cologne began, it would have to be July twelfth. Much against his most profound wish, coroner Martin Gänsewein is once again thrown in with Pascha, the foul-mouthed spirit who refuses to leave the Cologne Institute of Forensic Medicine. Bodies from the local cemetery are turning up with organs missing, and Martin realizes he needs the assistance of Pascha in order to solve the case. 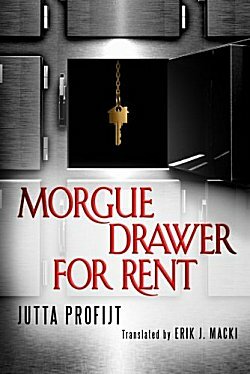 This third book in the series takes up right where Morgue Drawer Next Door left off. Cologne is in the midst of a horrible heat wave, asbestos is being removed from the Institute building, and the icing on this cake of complete havoc is the new head of the department, a bean counter referred to as "Piggy Bank" by all those under his lunatic thumb of iron. I am amazed at how the author has kept me intrigued with the idea of teaming an intellectual man of science with the deceased spirit of a hormone-fueled young car thief. This is a very odd couple indeed, and it works because these two do not remain static. Martin is the only human Pascha can talk to, but Martin has a girlfriend he'd like to move in with-- and not share her with "the voice in his head." As Martin frantically tries to come up with a solution to his problem, he's putting his relationship with his girlfriend in jeopardy. Pascha never sleeps, and there's only so many movies he can watch in Cologne's theaters. He's taken to writing his memoirs and trying to get them published-- with extremely interesting results. Although Pascha's grammar has improved gradually in the series, his descriptions are often crudely hilarious, and I've come to look froward to them. This series is succeeding with me because Profijt has her characters grow and change as various relationships develop-- and because it's obvious that she's having fun writing these books. However, I did have one area of concern in Morgue Drawer for Rent. Profijt does admit in a section at the back of the book that she takes some artistic license with a couple of subjects, but she took a bit too much for me. Her bending of the facts of asbestos removal and one other subject kept throwing me out of the story, and I'm no expert on either subject. Be that as it may, I'm enjoying this series too much to stop just yet! It is intriguing, Margot, and I'm hoping that the author doesn't bend the truth too much in the next book!